Van Gelder, Gordon (ed.) 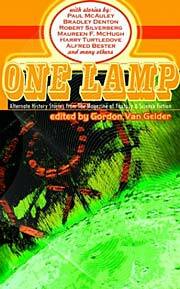 One Lamp: The Best Alternate History Stories from the Magazine of Fantasy & Science Fiction . Four Walls Eight Windows 2003. Summary: Collection of reprints, including Poul Anderson's w88 android, Alfred Bester's "The Men Who Murdered Mohammed", Ben Bova's "The Café Coup", Bradley Denton's "The Territory", Paul Di Filippo's "Plumage from Pegasus: And I Think to Myself, What a Wonderful World", Charles Coleman Finlay's "We Come Not to Praise Washington", Jan Lars Jensen's "The Secret History of the Ornithopter", C.M. Kornbluth's "Two Dooms", Paul McAuley's "The Two Dicks", Maureen F. McHugh's "The Lincoln Train", Robert Silverberg's "A Hero of the Empire", and Harry Turtledove's "The Last Article". Published: Four Walls Eight Windows 2003 (1568582765BUY).